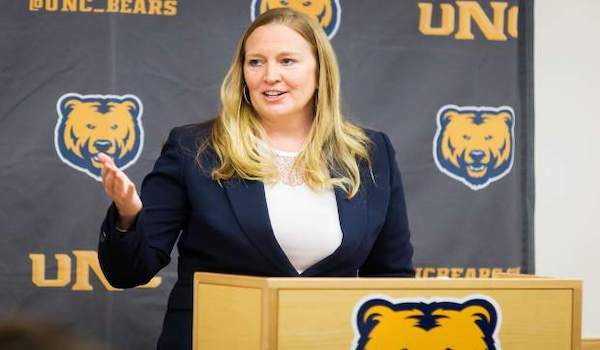 A Colorado native, Jenny Huth returned to her home state in 2018 when she was named the new Head Coach at the University of Northern Colorado. Huth arrived in Greeley after spending the previous seven seasons as an Assistant Coach at UCLA, helping lead the Bruins to four NCAA Tournament berths, including an Elite 8 appearance in 2017-18. Combined with her successful playing career at Colorado and two years as an Assistant Coach at Oakland University, Huth is drawing on all of her experience to establish similar success at UNC. Can you take us through the process up until and your emotion once you were officially named the new Head Coach at Northern Colorado? The process was really fast. I got a call from a search committee member asking if I had interest in the job. I had interest because of the location, which is close to home. There was also an established culture and I felt ready to take a leap of faith. The process was hard too because I was emotional coming off an NCAA Tournament Elite 8 appearance, watching two players get drafted to the WNBA, and now the idea of leaving a culture I felt a part of building was a tough decision. I went out to Colorado for an interview and then about a week later they offered me the job. I was 5 month pregnant on top of that so I had multiple variables, all good ones, I had to work through. They gave me 24 hours and I called our AD and accepted the position at Northern Colorado. When they named me Head Coach, I was overwhelmed, excited, nervous, and sad to leave UCLA too, but ready for this new adventure of being a new version of myself. What traits did you look for when interviewing and hiring your coaching staff? I look for people who know me and people who are aligned with my values. Loyalty and competence are huge. I look for well-rounded assistants that can coach, connect, recruit, and develop. They have to connect with people, teach the game and skills, and be willing to learn aspects they aren’t familiar with. Having spent a majority of your coaching career at the Power 5 level, how did your experience at Oakland University better prepare you for becoming a Head Coach at the mid-major level? There is a blue collar approach at this level that I really appreciate. When I was an assistant at Oakland, we did things a certain way. You could just recruit so much to your system and you had to find diamonds in the rough. Also, your budget shrinks a lot and you have operate differently. I’ve drawn on my experiences from Oakland in recruiting, scheduling, budgeting, and game planning numerous times. We had a really good team and culture there, and in many ways, implemented some of those positive aspects at UNC. I think at times the Power 5 level spoils you. It’s a hard transition for many BCS assistants, but I know that you really have to want to take the leap, have courage and love the game to do it. The Power 5 level is really intense. If you make a mistake, everyone knows about it and you’re under a microscope on national television. The mid-major level is a bit different in our exposure, but the coaching, intensity, recruiting, and strategy are equal, if not even more intense. After your first few months as a first-time DI Head Coach, what advice do you have for other assistant coaches who desire to become a DI Head Coach? Timing and fit are everything! I believe that it’s important to bloom wherever you are planted. Be the best assistant you can, for as long as you can. Think about the game from a Head Coach’s perspective, as often as you can without judgement. Pay attention to everything from culture, scheduling, skill development, academics, donor relations, recruiting, to budget. Everything within the climate of the athletic department you have the potential to enter. I was extremely please with how our administration supported me being pregnant and having a family. That was a huge key for me. In order to be successful you have to have support and commitment. You can’t rush that process just to be a “Head Coach” You must have advocates, genuine people that believe in you and that you can lead a program. These people can’t just be your acquaintances. They need to understand how you operate and know you have the courage and character to take on the huge responsibility of being a Head Coach.